with over 600 drawings and paintings. 37 The Boulevard Weston-Super-Mare BS23 1PE (location map). A selection of the original illustrations were also on display for sale. Looking upwards at the splendid architecture. A book that enables the looking up of information. The regeneration of Weston Town is looking up, postively improving. 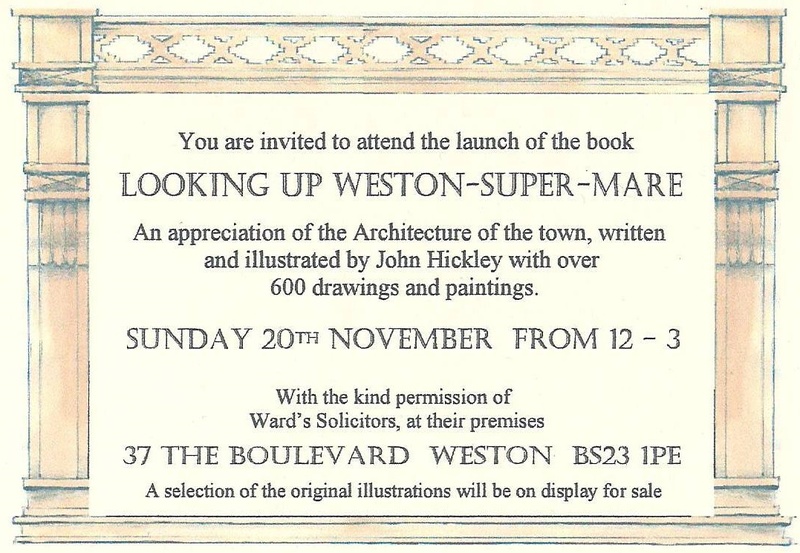 The main aim of this book is to encourage a closer look at the fine early buildings that Weston-super-Mare has to show, to encourage their care and preservation and to indicate where some of their newer neighbours have successfully added to the quality of the town's built environment. 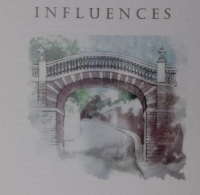 It aims to illustrate some of the wonderful buildings in the town and the influences behind their design. Much has been omitted, but optimistically, readers who may choose to explore in reality what has been shown in the book, will find even more treasures revealing themselves. Weston-super-Mare is a town whose major development started with the reign of Queen Victoria. It provides an opportunity to study the influences behind the development of Victorian artictecture, and that which followed it. Only a relatively few eighteenth century or early buildings existed to form a background on which to add, and so Weston provides an example of what could be called a Victorian New Town. The origins of Weston's buildings and the influences there have been on their development, international and historical. The work of influential architects and artists. The sources of architectural and decorative design. The effect of style, fashion and social changes. Looking forwards to the future. Weston originally grew from a tiny village of at least Saxon origin. The early buildings consisted of a handful of farmhouses and about a dozen fishermen's cottages of simple contruction. The original Medieval church of St. John's is first mentioned as the parish church in 1226. The rectory is now known as Glebe House. Artists, teachers and policitians ought to share the common goal of eye opening. We are surrounded by varied measures of beauty and ugliness, wisdom and stupidity, inspirational progress and crass decision making but for many of these yardsticks of civilisation go unnoticed until pointed out. John Hickley's observation, forensic analysis and superb artistic recordings of architecture in Weston-super-Mare truly are eye opening. Has a single gate pillar, barge board or tendril escaped his attention? Though John is rightly critical of some recent developments his missionary zeal for recording past achievment does not blight hope for an architecturally well-mannered and enlightened future. 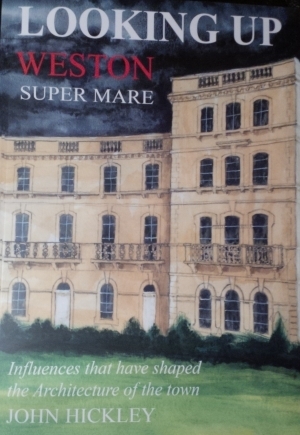 This book is a perfect guide for all who value and wish to enhance Weston-super-Mare, be they resident in 'stone town' or modern suburb. Hopefully it will also awaken a touch of passion in those of a more inert disposition. please use the contact form below to email John Hickley. You may also be interested in John's previous book 'An Illustrated History of Bleadon'.